How art can sharpen our vision to see the ordinary in new ways. Often people ask me why I’m so passionate about art. What does it do for me? I answer that it helps me notice things. Ed Ruscha is an artist who has endeavored to lift up the ordinary in his art. He created a book titled Twentysix Gasoline Stations. 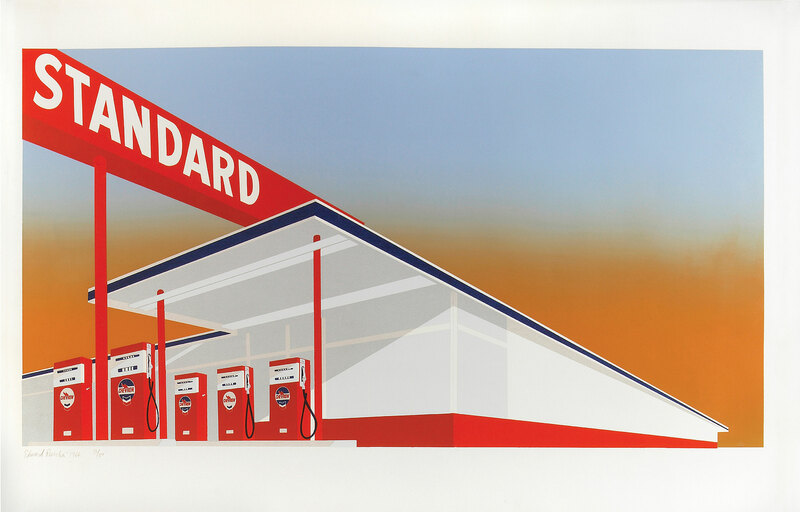 This Standard Station (1966) print is one of several versions of the same Standard gas station. It is a picture of Americana yet it is also a projection of angles, lines, and color. It’s not really a gas station as there are no cars or people. It’s a structure common in our daily lives. In this presentation it is a celebration of the design of the ordinary. This piece of art sharpens our vision. We see what we want to see. But we can see the same thing differently. The eyes are tricky in what is processed by our brains. We can see more or less. We can see interesting design and color in things that cross our path every day. We can even see beauty where previously we would have hurried by in a daze. Art helps us train our eyes. Such "seeing" lifts our spirit and can enable us to bring serenity to our day. In this version of the Standard Station, the sky is at dusk; it seems to be melting down and thereby exudes warmth. Recently at the International Pop Art Exhibit in Minneapolis, I happened upon another of Ruscha’s Standard Stations prints. It was at night. The sky was black and strong beams of light shone down on the structure. The stark yet strong light reminded me of a classical composition, and, I have to admit, it stopped me in my tracks. Our lives are full of interesting things that form the backdrop of our activities. Noticing what surrounds us can yield visual surprise and delight.